Greetings from France! Just a short post from Arles from our hotel which has wifi. Smooth travels so far (rented a car today and Eric has been driving without incident). Food has been comme çi comme ça in Provence but we did have an interesting meal yesterday at L'atelier de Jean-Luc Rababel. I wish that I had packed my USB cord for my camera but I did not anticipate having free internet access through our trip. 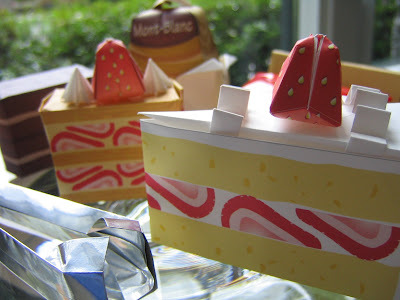 Instead, the photo above (photo by Peter Fong, Ganache) displays some of my last handiwork from my stint there. 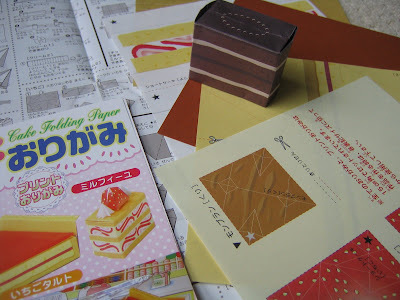 The last four of my working days were spent doing chocolate which left my left hand and wrist sore and achy! But on my final day, assembling all the pieces and adding the flowers made all the chocolate labour worth it. I am sad. Today was my last day working at Ganache. Despite some initial anxiety and the usual self-doubts, the experience was a very significant milestone in my professional life. These three months have reinforced my belief that pastry is the right path for me. Being satisfied and happy after completing a day's work has long been a foreign feeling. In contrast, even without pay and being physically exhausted, my experience at Ganache was so rewarding. I have gained an enormous amount of insight into my own pastry-related strengths and weaknesses and learned many lessons about how to improve. For those of you who are currently in pastry school or considering a career change into pastry, perhaps my reflections will somehow benefit you. 1. Be clean...very clean. I always believed that I worked cleanly at school but once I arrived at Ganache, I quickly realized that my version of clean was not as clean as clean could be. When everyone else working around you is spotless and you look like you were attacked by chocolate mousse, it does not leave a positive impression. Luckily, I improved significantly after this was made apparent to me. 2. Being efficient is impossible when doing something for the first time. This lesson was hard for me to accept because I have always thought of myself as an efficient person. When I realized that I took up twice as much space or used twice as many bowls or took twice as long to complete a task, I was very distressed and disappointed in myself; however, after the second and third repetition, I was able to streamline my technique and recognize how much time each step was required in order to eventually be more efficient. 3. Things are heavy. Being only 5 feet 3.5 inches and with very little muscle mass, the physical demands of the pastry kitchen were astounding to me. Everything is in larger quantities than at school and consequently, everything is heavier. It seems like a very simple and obvious fact but in reality, the impact on my back, hands, and especially wrists were quite severe when I was working 5 days a week in the kitchen. 4. There are many ways to do the same thing (be open-minded). For example, the first time I was asked to make a sauce Anglaise at Ganache but to use a whisk on high heat, my jaw almost dropped to the ground. But in time, I learned that there can be many ways to do things without compromising quality as long as you do it right. There have been many other instances in which alternate methods are used and I have accepted all these new techniques as part of my repertoire. Ultimately, I feel quite prepared for my next practicum with Chef Ted Hara at the Pan Pacific Hotel. The environment will be very different, with more people and a different pace. Shiftwork will also present another challenge for me because as a creature of habit, I do not adjust well to changing schedules. Nonetheless, I am up to the challenge! 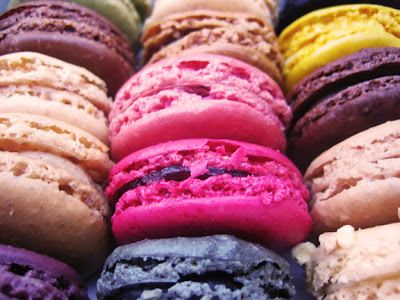 Meanwhile, please enjoy this photo of beautiful Parisian macaroons which I found in Flickr. The list of pastry destinations which I intend to visit is enormous and I hope that I can still fit into my uniform upon return. À bientôt! Growing up, Eric always had a Black Forest Cake from Safeway as his birthday cake and still has great fondness for this traditional dessert. Flipping through Alain Ducasse's Grand Livre de Cuisine: Desserts & Pastries (which was a Christmas present from Eric), I found his Forêt Noire version and decided to create a similar version, using chocolate biscuit and dark chocolate mousse recipes from my own collection. 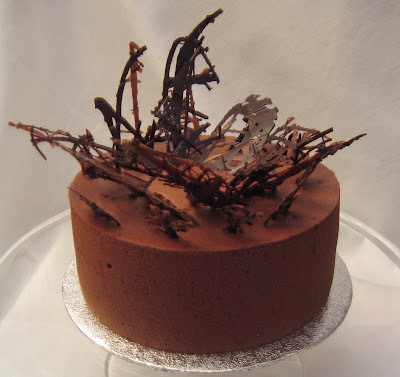 The entremet would have appeared more "finished" if I had a chocolate sprayer and fresh cherries; however, my chocolate decorations (to represent an abstract forest) did suffice. 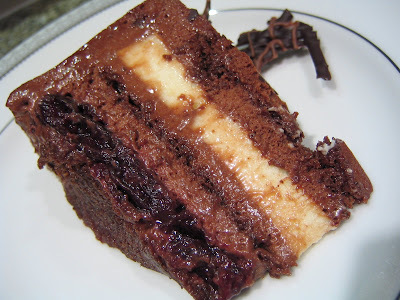 Starting from the bottom, the layers are: chocolate biscuit, cherry compote, dark chocolate mousse, 2nd chocolate biscuit, kirsch cream, more dark chocolate mousse, 3rd chocolate biscuit, more dark chocolate mousse. Both the compote and kirsch cream layers were assembled as frozen inserts. Even though cherry and chocolate are not usually my taste, it made a lovely entremet which we enjoyed with kir royale. No offense to Safeway, but this version was definitely more palatable! It is hard to believe that I am well into my third month at Ganache. My comfort level has increased significantly, although I am still prone to the occasional absent-minded mishap. The timing and work flow learning curve have improved greatly but I believe that I still need to be even cleaner in my techniques. The recognition of my improvement has not been obvious to me, mainly because I still view my performance through "pessimist" eyes (a chronic bad habit). This week, however, a new practicum student from Vancouver Community College began her 3 week practicum and this gave me a chance to reflect on how far I have come since January. As a result, I am more confident in my skills and feel more prepared for my Pan Pacific practicum. 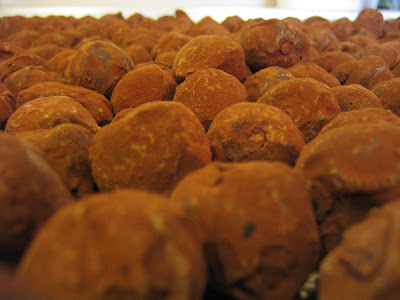 On Friday, Cathy, the new student, and I spent the day finishing over 1000 truffles by hand. The ganache (70% dark chocolate) was prepared the day before and piped into small mounds by Chef Peter that morning. Because it is piping consistency at room temperature, in order to form them into rounds, they are chilled in the fridge and then hand-rolled IN THE FRIDGE. We spent the morning shivering in the walk-in fridge, rolling tray after tray of ganache balls. Then, I hand-coated them in tempered dark chocolate while Cathy rolled them in cocoa powder. Undoubtedly, I do not wish to see another chocolate truffle for a long time (the mushroom variety is just fine though! ).